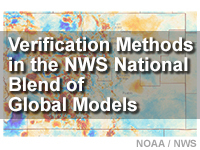 This lesson introduces learners to the methods used in verifying the various weather element forecasts included in Version 1.0 of the U.S. National Weather Service (NWS) National Blend of global Models (NBM). This Level 2 lesson is intended for forecasters and users of NWS forecast products; some prior knowledge of numerical weather prediction and statistics is useful. Learners will be introduced to the analysis of record used to verify the NBM. Learners will also explore single event, grid-to-observation, and grid-to-grid verification methods, as well as how to interpret the results using the Blend Comparative Viewer (BCV). These modules are more geared to a modeler's understanding of NWP then that of an operational forecaster. Very informative about NWS new Blend of Global models. This is not an effective training method for me. The course is good at describing the types of verification techniques that can be used. But there seems to be a barely substantiated bias towards URMA as the best analysis package. It only talks about temperatures and makes mention of wind and QPF but then never shows how URMA is the best analysis for these parameters. It also has a bias toward Blend as the superior forecast, which may be right. But it does not do a very good job of showing where Blend may have some weaknesses. It was hard to see the numbers! The graphics displayed weren't clear enough. The numbers within the pictures were not legible enough as well. A little difficult to follow. This lesson was simply propaganda promoting URMA/RTMA. I do agree that a National approach to NDFD needs to come, but this lesson was more about convincing forecasters that URMA/RTMA blending is better than current collaboration methods making NDFD. I'm fine with a National approach, but it isn't necessarily superior to collaboration approach for anomalous weather (e.g., mountainous terrain of western CONUS more challenging for URMA/RTMA blend, with NBM far inferior to SuperBlend method in quiescent weather). Great overview of the verification of the National Blend.